But let’s look closer; what’s actually freaky in this scenario? Insects form a part of the diet of over two billion people, and over half of the planet’s population is familiar with them as a snack. Perhaps we’re the freaky ones if we turn up our noses at them? And what’s more disgusting? : chewing the ‘mechanically recovered’ innards (yes: lips, bogies, blood vessels and ground-down, sieved carcasses) of GM grain-stuffed, antibiotic-injected, greenhouse gas-emitting cows – or choosing something clean that consumes only vegetables and converts its food into protein with over twenty times more efficiency and a tiny fraction of the carbon footprint and land use of their bovine counterparts? There are nearly 2,000 edible types of insects. They put rabbits to shame with their speed of reproduction, they produce body mass with incredible speed, and there are 40 tons of them for every human on the planet. So with land scarce, oceans overfished and food production needing to double to cater for the 9 billion humans Earth will host by the year 2050, what are we waiting for? Why aren’t we all crunching crickets and munching mealworms? In Thailand, kids come running for fried grasshoppers and pandan leaves; in neighbouring Cambodia they go nuts for grilled tarantula with soy sauce. And with the vast means of food production technology available to us in the West, we have no excuse not to start experimenting with this protein-rich, super-healthy ingredient. So how can we start changing our attitudes towards entomophagy (the eating of insects)? For a start, we might think about stopping calling them “insects” when talking of them as food, and thereby break any negative associations people may have. A small measure, perhaps, but you won’t find anyone telling you they’re going out for a pig chow mein or a sliced cow sandwich, and it could be psychologically helpful if we came up with a different name. Put ‘entomophagy’ into an internet anagram generator, and one of the results is ‘mega typhoon’. “Kids, come in for your mega typhoon!” Now that’s pretty cool. Secondly, there’s a lot you can do with insects. You can grind them to a powder and turn this into pasta and eat it just like you would normal wheat pasta, only benefiting from about six times the protein. You can make burgers or falafel-type bites. You can use it as flour in a cake, only without most of the carbs. You can make fantastic crisps out of it, and not have to feel guilty about ‘empty calories’ afterwards. 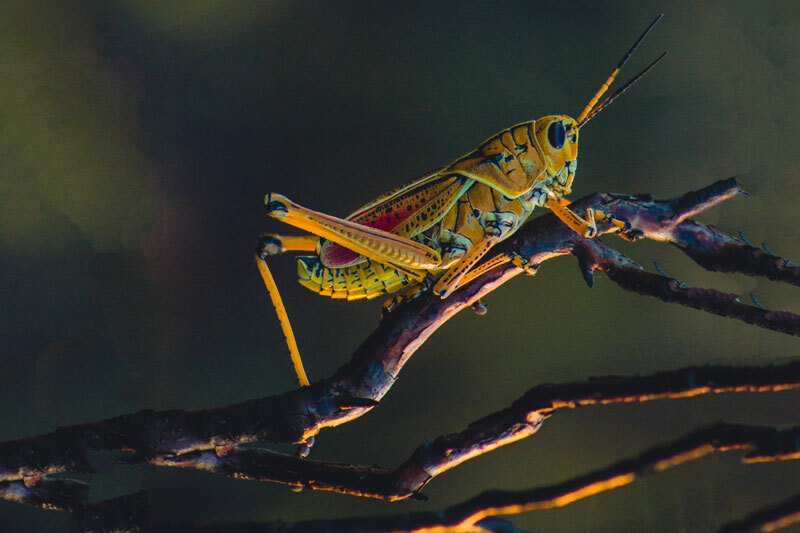 Gym-goers and body-builders can whizz up grasshopper powder with milk and blueberries for a body-replenishing, restorative, muscle-enhancing smoothie – and with some grasshoppers containing 75% protein, this is a level comparable to pea protein powder, which is recognised as one of the most protein-rich natural powders out there. And all this is before you take into account insects’ abundance of minerals and good fats. Go lift up those rocks and start eating insects – alternatively Crobar do snack bars and Grub sell them already picked and washed. No Comments to "EAT BUGS AND SAVE THE PLANET"